Tips For Glowing Skin By Beauty Professionals | Top Beauty Blog in the Philippines covering Makeup Reviews, Swatches, Skincare and More! A good beauty regime that includes cleansing, toning and moisturizing is among the best ways to clear your skin and leave it looking vibrant and healthy. A good toner will help to balance the PH levels in your skin, minimize the size of your pores and tighten your skin for an overall conditioned effect. We all love the sun. Whether it is spending time tanning in the backyard or frolicking in the waves, many of us spend a lot of time taking in ultraviolet rays, often with little or no sun protection. Overexposure to the sun can make your skin begin to age prematurely, make it rough and contribute to the development of fine lines. Investing in a good sunscreen, limiting the amount of time you spend outdoors and making use of protective clothing such as sun hats and other items will help prevent this eventuality and keep your skin looking fresh and glowing. If you are not getting enough water, it will show up in the way your skin looks in the form of dull and dry skin, chapped lips, scaly patches and even peeling. Beauty experts and nutritionists suggest drinking up to three liters of water which will keep your skin plump and increase the elasticity of your skin and result in a glowing complexion. Regular exfoliation with a gentle and natural product will help to remove dead skin cells to reveal the newer ones underneath and keep your skin looking radiant. Dieticians recommend eating foods high in vitamins and minerals as well as those rich in monounsaturated fats in order to keep your skin in tip top condition. Foods rich in Vitamin C as well as those that contain high levels of omega 3 fats contribute to collagen production, moisturize skin from the inside out and combat inflammation of the skin. It is possible to achieve a glowing and healthy looking skin by incorporating a few simple strategies. Limiting sun exposure, a balanced diet, investing in a good cleanser and exfoliating on a regular basis should help you to take better care of your skin, and ultimately result in the glowing complexion that you are looking for. Thanks for sharing these tips on eating well and drinking water for your skin. I always struggle with the water part. Thanks for your tips dear! Such a helpful and great post. Looking forward to incorporating these tips! I also enjoy using oil based procuts! BLOG M&MFASHIONBITES : http://mmfashionbites.blogspot.gr/Maria V.
I found this post at the right time. I generally have always had good skin and rarely broken out. Recently my skin has been bad due to stress and my skin has been more oily than normal. I'm going to give this regimen a try and see if it helps. Thanks for this post it was so informative! Fabulous review. Loved your detailed post. Love Clarins products! Thanks for your helpful post darling! That is a helpful post! Especially after winter our skin needs some extra care! Ma quanti bei prodotti!! Tutti molto interessanti e da provare!! Great tips thx for sharing. 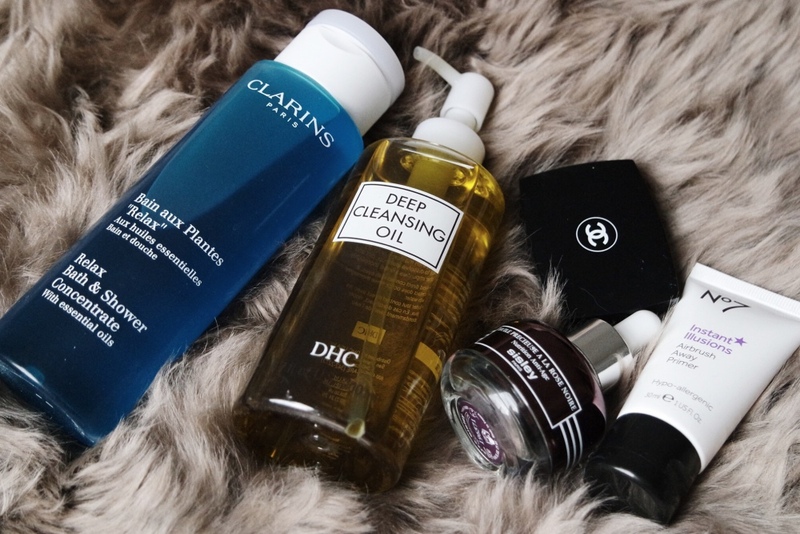 I've been following most of these tips daily to get my skin ready for spring/summer! I've definitely noticed a difference from using toner as well. Thanks for the detailed tips!